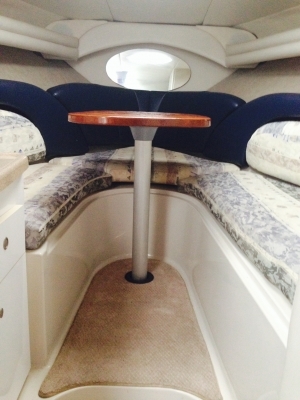 "Cool Breeze" is the perfect boat for your self-drive or skippered charter. 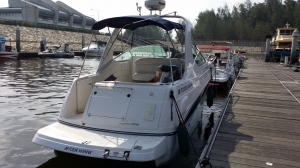 This Four Winns 268 Cabin Cruiser is a fast, comfortable and elegant cruiser, ready to take you, your friends and family out to sea for the day. The deep V hull, powerful motor and trim tabs keep the boat balanced and give a smooth ride through the waves. With plenty of seating on the deck and inside the cabin, your journey from the marina to your chosen island will be quick and comfortable. Arrival at your chosen island is made easier with the remotely controlled windlass for dropping anchor in the bay, or the large swim platform and walk-through transom door for easy access at the dock.